Tony Dyson, the creator of R2-D2 and Emmy-nominated film SFx supervisor who worked on films such as Superman 2 and Moonraker, Dragon Slayer, Saturn 3 and The Empire Strikes Back, has passed away. Professor, author, educator, and more, Tony Dyson was also keenly interested in Second Life. He first became involved with the platform, as Azar Shelman, while investigating distance learning mediums, and recognised the Second Life’s potential as a means of creating real-time animation, something he had tried to do outside of the platform without much success. As a result of getting involved in SL, he was introduced to machinima producer and publisher Chantal Harvey, (via Phalen Fairchild), and they found they had much in common. Chantal invited Tony to head the jury in the 2012 48 Hour Film Project for machinima, and thus a working collaboration between the two of them was born. As well as investigating ways and means to produce better machinima, this collaboration led to the development of Bobbekins, interactive e-books for children which would utilised advanced animation, music, and machinima shot in Second Life, and illustrated by another SL resident, Dawny Daviau. Bobbekins was developed on the idea that children expect to engage all their senses when involved in a story or learning exercise – something to which educators can attest. Filming took place in Toy City, created by Tony as a constantly changing place discovered by the alien Bobbekins, who claimed it as their home. The books were developed under the Netdreamer Publications banner authored by Tony, illustrated by Dawny and edited by Chantal, and the first book in the series, Medieval Farm, is still available through Amazon (and you can read more on the project here). However, it is the builder of R2-D2 that he will be most clearly remembered. 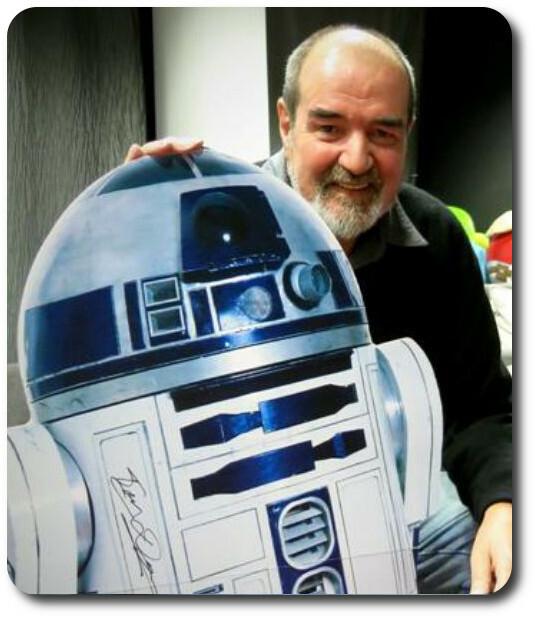 A regular guest at science-fiction conventions around the world, he never lost his love of the cylindrical little robot, and used the fame he gained through his involvement in star Wars to talk about creativity and learning and give ene[encouragement to young people to pursue their creative endeavours. As well as building the original eight R2-D2 units, Tony Dyson was responsible for the design of Hector, the robotic antagonist in Saturn 3, and developed a robotic character modelled on (and voiced by) John Cleese for a series of television adverts aired in the 1980s for Sony. He also designed robots for Philips and Toshiba. Tony Dyson had a wonderful view on creativity “Be playful,” he told the The Times of Malta newspaper in 2015. “Never stop playing. If you look at life the way it really should be – enjoyed – then you become very creative”. It’s a view he shared with Shad Engkilterra at the Malta Comic Con in 2015. Tony Dyson passed away at his home on the island of Gozo, Malta. My condolences to his family, and to Chantal and Dawny, and those who knew him. I’d watch for Cypress Rosewood to do something at his Sunday night performance in Dyson’s memory.